This book is about those people in institutions of civil society in Ireland who are working to imagine and work for a new and peaceful future for Northern Ireland. One feature of the book is that it begins with an orientation about the discussions among scholars and activists about "forgiveness", "history and memory" and "reconciliation". 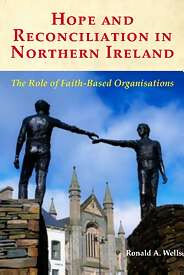 With that essential context made, the book delineates and explicates the work of the various organisations that are on the forefront in creating a new future that will supplant the past that brought "the Troubles" to Northern Ireland. Most of the entities examined are church or parachurch organisations. The two exceptions are important: Healing Through Remembering and the Consultative Group on the Past. While the last two named are not religious in foundation, they are nevertheless important in discussing the highly moral task of creating a renewed society in Northern Ireland. The view of the book is that hope for a new beginning, however guarded and tentative, is possible for the long-suffering Northern Irish people. As to contribution, this book brings a new emphasis in taking seriously the point that for peace to come fully to Ireland, the actions of politicians must be matched by the actions of those in civil society. "This book is just like its author - full of wit, warmth and wisdom ... it is a pleasure to encounter a work powerfully shaped throughout by a hermeneutics of hope."